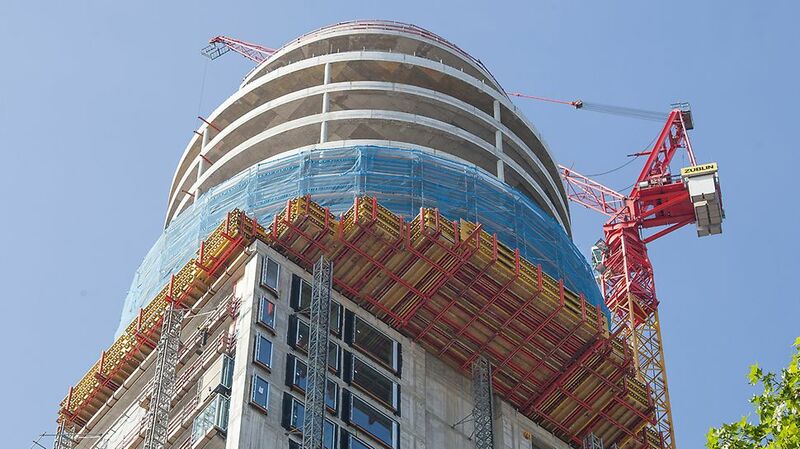 140 m high residential tower with cantilevering circular section at the top as well as a 5-storey base structure. 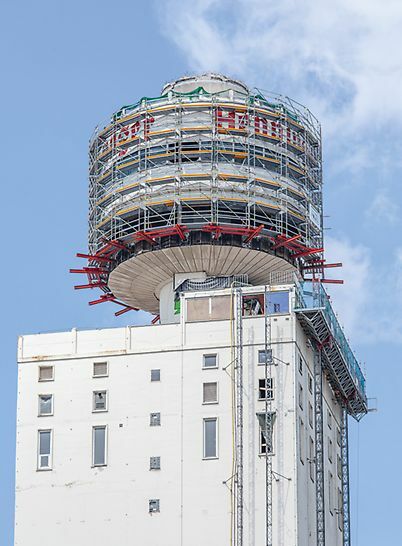 At the top of the so-called Barrel – the 39th floor – is a restaurant; additional panoramic views are provided by the observation deck on the floor below. 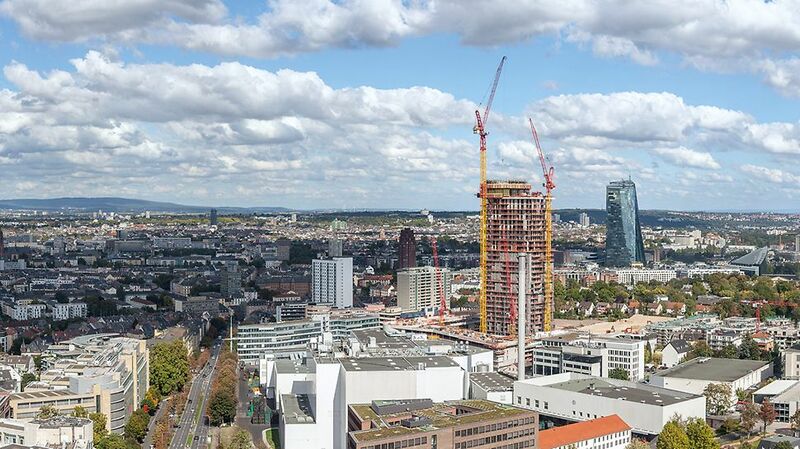 The very distinctive architecture of the building with the barrel and bright northern facade have re-created the old Henninger Turm, a former grain storage silo which featured a revolving restaurant at the top of the tower. 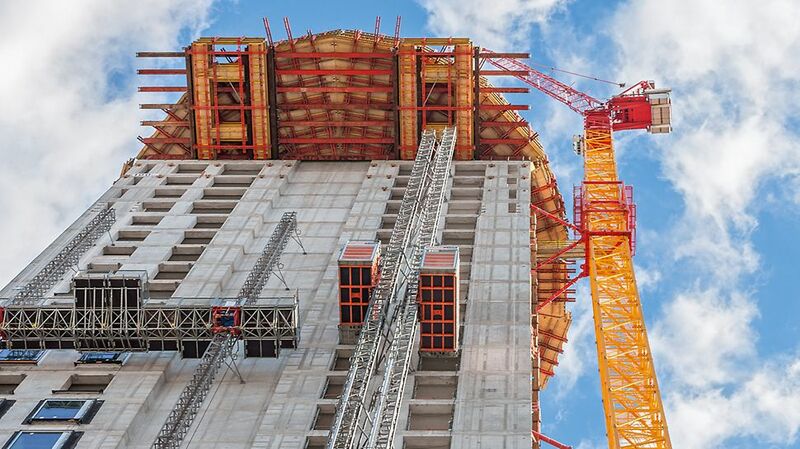 Construction of the elevator shaft with only a minimum of crane support. 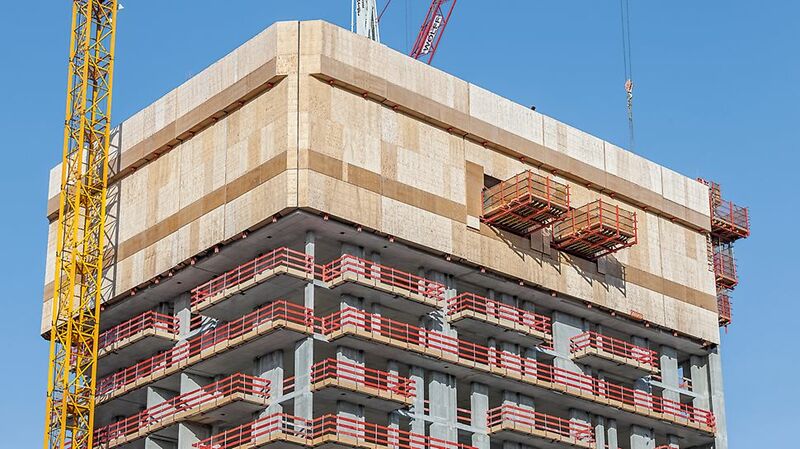 Enclosure construction for safe working operations while taking into account canterlevering balconies. 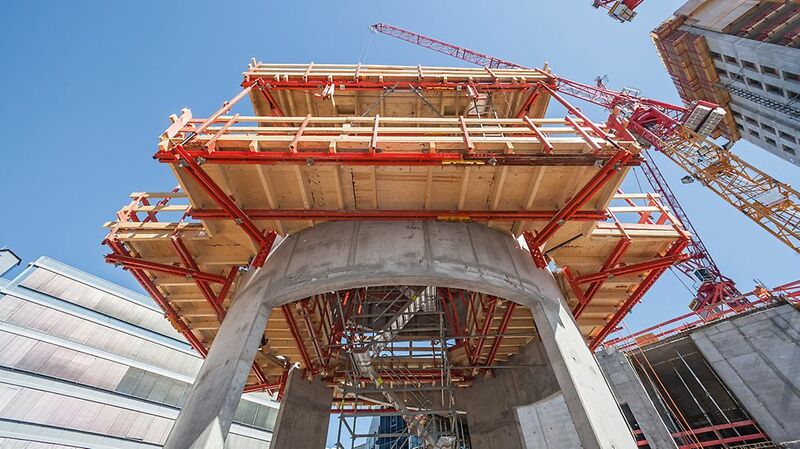 Cantilevered working platform at a height of 100 m for the construction of the barrel section, for supporting and load distribution in the core and external walls. Parking garage ramp with large wall openings and restricted anchoring possibilities for climbing platforms. Cost-efficient and project-beneficial optimized implementation solutions on the basis of a jointly-developed workflow concept. Safe working conditions during all construction phases. The project support provided by PERI in the form of planning workflow concepts as well as many other additional services was outstanding. PERI already made a convincing case at the time when the formwork offer was submitted through their innovative ideas and proposed solutions. 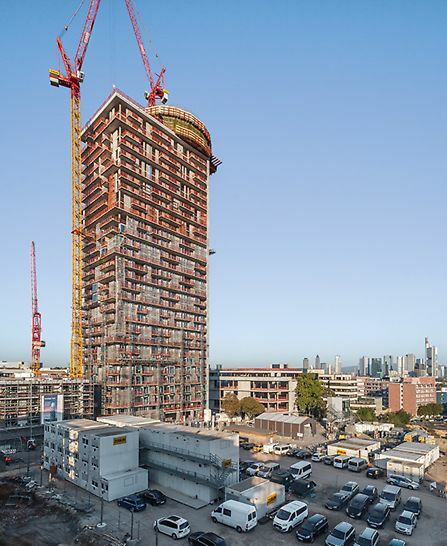 In the subsequent order processing, the formwork concept could be continually updated while working closely with the contractor and PERI´s technical office, and further optimized for everyone involved in the construction. Here, in addition to the technical feasibility as well as fast scheduling realization, great emphasis was placed on ensuring cost efficiency. Workflow concept with formwork, scaffolding and services from a single source. 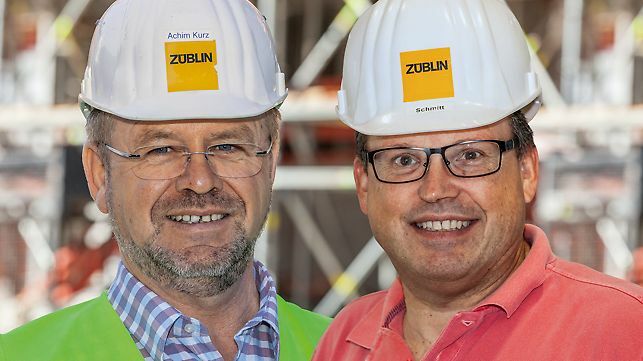 On-site project support through the provision of a project coordinator and supervisor as well as a project-specific implementation and safety concept. 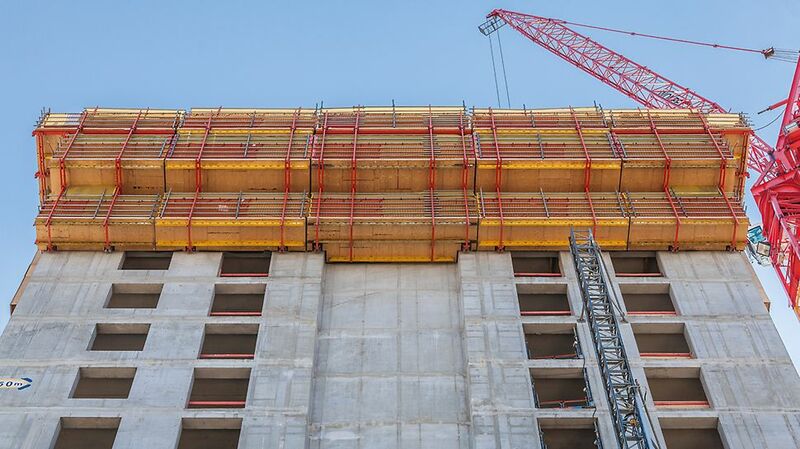 To the greatest possible extent hydraulically-operated climbing formwork and protection panel solution on the basis of the ACS and RCS Climbing Systems with only a minimum of crane support. Up to 8 m cantilevered working and scaffolding platform for the 40 m high barrel-style construction on the basis of rentable system components. 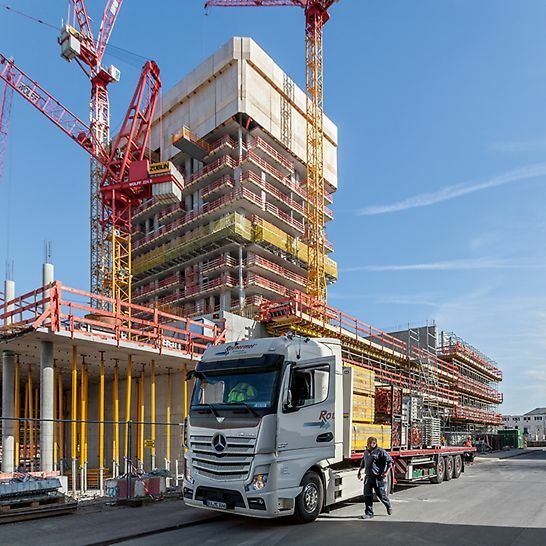 Planning and delivery of climbing formwork and platforms for the parking garage ramp while taking into consideration the consistent implementation of the safety concept.